The Cape Verdean Isles and jazz are not obviously connected, though Horace Silver’s father hailed from the islands and Silver’s music invariably contained African and especially Latin elements. 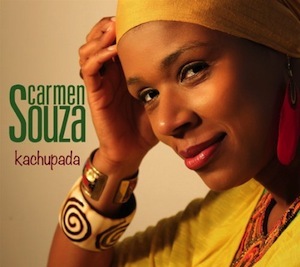 Cape Verdean jazz singer Carmen D’Souza definitely does not belong to the mainstream of vocalists in the jazz idiom and her sound is more a fusion of traditional Cape Verdean rhythms such as morna and coladjon as well as modern jazz, piano jazz most notably. This album (her first dating back to 2005), recorded in Lisbon, is a largely original selections of compositions co-written between D’Souza and Theo Pas’cal. However, it does contain two surprises in highly original reworkings of jazz standards. Charlie Parker’s ‘Donna Lee’ has never been heard sounding quite like this before and this fresh approach has all the feel of a Jazz Hot Quintet recording with accordion and strummed guitar. A more conventional take on Rodgers and Hammerstein’s ‘My favourite things’ is sung in English with a style that can only have been influenced directly by Macy Gray and is the nearest thing to a straight jazz piece with flugelhorn, though the use of Cape Verdean percussion gives this a slightly exotic twist. Of the original material, ‘Ivanira’ has a lovely shuffling beat to it with a fine piano solo from Jonathan Idiagbonya while Carmen’s voice deepens somewhat on the jazzy ‘Luta’ complete with double bass and flute. The light and breezy opener ‘Manhå 1 de Dezembro’ features a catchy repetitive chorus. In general D’Souza’s voice is an acquired taste with a high pitched delivery that is quite idiosyncratic, but her vocalese is straight out of the Ella Fitzgerald songbook which is no bad thing and her vocal influences vary between Billie Holiday and Nina Simone, while instrumentally she has listened to the music of Harbie Hancock, Keith Jarrett, Horace Silver and Joe Zawinul, hence the interest in jazz instrumentation. Having performed to critical acclaim at Womad in 2005, Carmen D’Souza is a singer who can easily switch from jazz to roots styles at the drop of a hat and with aplomb. The title track incidentally refers to a traditional gathering of friends and family in the Cape Verdean islands when they come together to eat the local soul food.